Vefa's Kitchen is a cookbook I've had on my shelves for a while now, and is one I often pick up when I want a culinary trip down the memory lanes of Greece. And whenever I think back to one dish or another that I've eaten on one of my trips to the Greek islands, and am wondering whether or not I can recreate it, I only have to pick up this weighty tome and I can almost always find what I'm looking for. This week I had the need to come up with some portable food, and what could possibly be better for portable food than pie? Actually what could be better for all sorts of things than pie? Not a lot, but as a self-confessed pastry-phobe (making it that is, not eating it), it's not something that gets produced very often in my kitchen. Of course, phyllo pastry is an absolute God-send to a pastry phobe. For a start no-one, not even for an instant, expects you to make your own. It's readily available in most supermarkets, and keeps for ages in your fridge. It's also very easy to use, but produces stunning results. This is another one of those examples of the end result always earning you more credit than the effort that actually went in merits. Love things like that. Also, there is something about those delicate, flaky, crisp shards of pastry that almost makes me feel like this is the health food equivalent of pastry. Of course, layered up with all that extra melted butter or oil, we know it's not, but I like to think it is. As soon as I think about phyllo pastry, I am immediately reminded of Greek pies and pastries, and the way they use phyllo to stunning effect in so many ways. 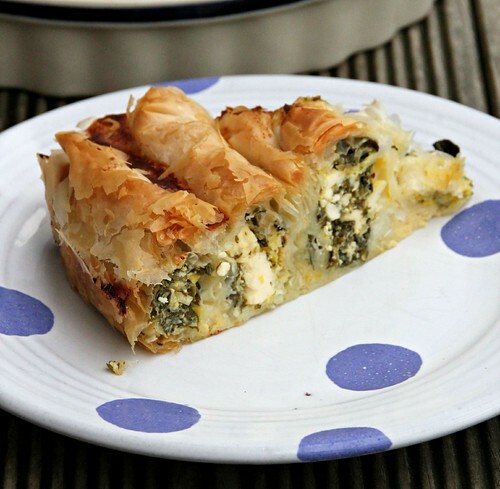 So it was that I turned to Vefa once again, thinking of perhaps creating some spanakopita. 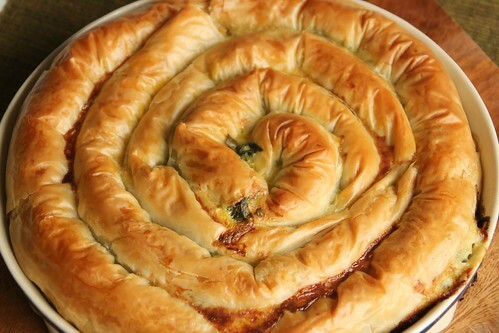 I found her recipe for a Spinach & Cheese pie, which in this case was simply several layers of phyllo in the base of a pie dish, filled with the spinach and cheese mixture, and then topped again with several layers of phyllo. And you could certainly keep it as simple as that and still end up with a great pie. However, I'd seen pies made into coils like this in some of the Greek bakeries and decided to give that a try. It really took very little extra effort, and the results were stunning. I hope you'll give this a try. 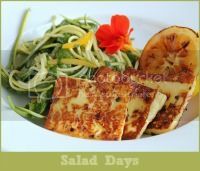 It is perfect for a light lunch or supper with a simple salad, and it also makes great picnic food if you happen to live some place where picnicking might be an option right now. Of course, there's also nothing wrong with throwing a colourful blanket and a few cushions on the living room floor and having an indoor picnic to inject a little bit of summer into the middle of winter. Preheat your oven to 180 degrees C (350 degrees F), and lightly grease a 23 cm (9 inch) flan or pie tin with oil. Cut leek in half lengthwise, wash and dry well, and then slice each half thinly, crosswise, so that you end up with thin half circles. Heat the tablespoon of olive oil in a saute pan over medium heat, sprinkle with flaky sea salt, and cook until the leeks are softened but not browned. Remove from pan and set aside to cool. Remove the coarse stalks from the spinach and put the leaves into a colander. Sprinkle liberally with sea salt, and using your fingers, rub the salt into the leaves. They will start to give up some of their moisture and start to "wilt" down. Rinse well, and drain. Tip the leaves into a clean tea towel, and squeeze firmly to wring out all the excess moisture. Alternatively you could blanch the spinach, but why dirty a pot unnecessarily?! Put the spinach into a large bowl. Add the cooled leeks, the chopped dill and parsley, the crumbled feta, yoghurt, beaten eggs, and melted butter. Season liberally with pepper - you won't need to add salt, as there will be more than enough saltiness from the feta. Mix everything together until well combined. Lay your stack of phyllo sheets out on a clean tea towel. You will be working with one sheet of time, and it helps to always keep the remaining sheets covered with a damp tea towel, as they tend to dry out quickly. Place one sheet of the phyllo dough directly in front of you, and brush lightly with olive oil. 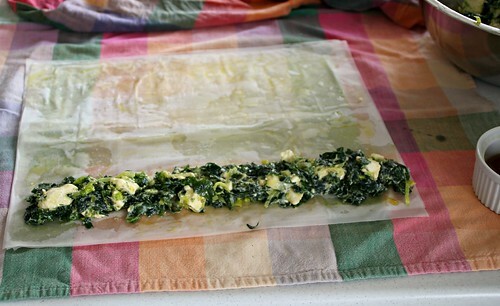 Place a second sheet on top, and brush it with olive oil. Repeat with a third sheet. With the long edge towards you, place a few spoonfuls of the spinach mixture all the way across the width of the dough. Now roll the dough up into a long sausage - see photo "step one" below. Then, take that spinach roll, seam down, and curve into your pie dish, and brush the top with a little olive oil - see photo "step two" below. Now repeat the above steps, to make four more spinach rolls. As you make each one add it to the pie dish, overlapping the end of the previous roll, and starting to coil the rolls in towards the centre of the dish - see photos "step three" and "step four" below. Make sure the whole top is lightly brushed with olive oil. Sprinkle with a little water and bake in the preheated oven for 50 to 60 minutes, or until golden brown. This is heavenly while still warm from the oven, but is also pretty hard to beat served at room temperature too. Vefa's Kitchen is available from Amazon in the US, Amazon UK, and from Fishpond in New Zealand. I am sharing this pie this week with my friends Michelle at Ms. enPlace hosting See Ya In the Gumbo, and with April at The 21st Century Housewife hosting Gallery of Favourites. I love the coiled pies like these - I do one which has a pumpkin, feta and chickpea filling. Easy but very elegant! Oh my gosh - that would be fabulous with a fumpkin, feta & chickpea filling - I totally have to try that. What a beautiful way to present that pie! I'd never have thought of doing it that way.. I've usually just got sheets of phylo adhered to every surface of the kitchen by the time I'm done. And spinach pie is one of my "I can eat the whole thing" pies. Sue, I just love the way you shaped the spinach feta pie into sausage shapes, and made it in a circle. So creative, so delicious and very attractive this way! I also made one several months ago, but in an oblong shape! Wow I have never seen a coil pie before. Love it! Will have to try this one! Looks great Sue! I had some filo left over from a class Friday and I really should have made this rather than the naughty baklava that I did make! how delicious! i could definitely go for a slice right now! This looks simply delicious! The filling looks incredibly delicious! I do have a pack of filo in my freezer, has been there for ages, got to used that up! 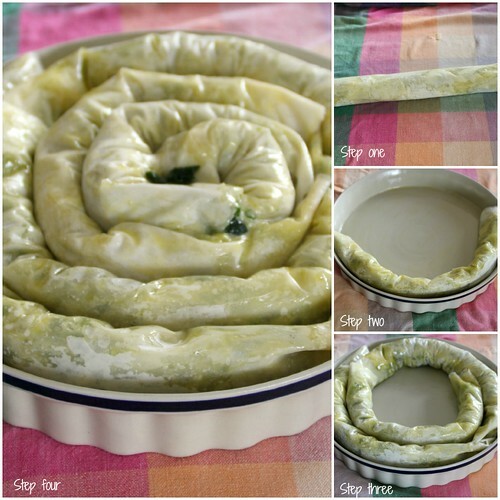 I love spinach and feta pie and am in awe of this coil method. Stunning is right! The finished product looks like it would be hard, but the way you explain it and your pictures let me know I could actually do this. What a beautiful pie, Sue! You've explained the method so beautifully, it looks really do-able too. Filo pastry really is a wonderful thing, especially as it's definitely okay to buy it ready made! I think your filling ingredients sound absolutely scrumptious as well - love the addition of the dill! What a delicious pie! I have never seen a pie wrapped in phyllo before. I love the idea. You made one special spanakopita my friend! It looks absolutely mouthwatering and Vefa is for Greece what Julia Child is for US. She was the first who promoted cooking and brought to Greece new flavors. I love your pita! Oh my goodness, I can just imagine how amazing this tastes, and while it seems daunting to make your instructions are so easy! Bookmarking it to make later! And I love your blog!